The aim of this study was to compare the efficacy of treatment with insulin alone, insulin plus acarbose, insulin plus metformin, or insulin plus rosiglitazone in type 2 diabetic subjects who were previously on insulin monotherapy, and to evaluate the effects of these treatments on cardiovascular risk factors including lipid profile, C-reactive protein (CRP) and fibrinogen. Sixty-six poorly controlled type 2 diabetic patients on insulin monotherapy were involved. They were randomized to insulin alone, insulin plus acarbose, insulin plus metformin, or insulin plus rosiglitazone groups for 6 months period. Mean fasting and postprandial glucose values as well as HbA1c levels significantly decreased in all groups. The greatest improvement in HbA1c was observed in insulin plus rosiglitazone (2.4%) and in insulin plus metformin (2%) groups. 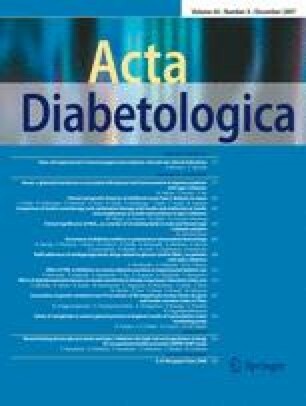 Daily total insulin dose was increased to 12.7 units/day in insulin alone group, decreased to 4.7 units/day in insulin plus rosiglitazone group, to 4.2 units/day in insulin plus metformin group, and to 2.7 units/day in insulin plus acarbose group. Least weight gain occurred in insulin plus metformin group (1.4 kg) and greatest weight gain occurred in insulin plus rosiglitazone group (4.6 kg). No significant change in lipid levels—except serum triglycerides—was observed in any groups. CRP and fibrinogen levels decreased in all groups, but the decrease in fibrinogen level was significantly greater in insulin plus rosiglitazone group. All groups were comparable in hypoglycemic episodes. No serious adverse event was noted in any group.